The 857 .38 fits most hands well. the proven and immensely popular Taurus 85, a small frame revolver that holds five .38 Special cartridges. The 856 is a version of the Model 85 with a six shot cylinder. It is quite an engineering feat to design such a revolver. The revolver illustrated, the 857, is even newer and at present a bit difficult to obtain. The 857 is an aluminum frame version of the steel frame 856. 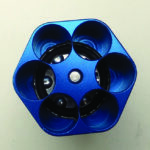 While the steel frame revolver is easier to fire and use well as the extra weight absorbs recoil energy, the aluminum frame version is easier to conceal. 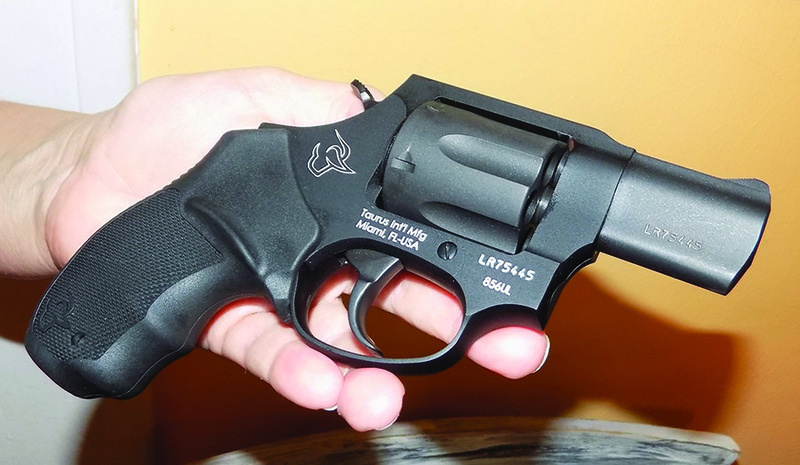 In this day of eight shot N-frame revolvers and seven shot GP 100-sized handguns, the Taurus 856 is big news in a real way. Colt and Taurus cylinders compared. number we are more comfortable with. It is the old debate of a J frame .38 versus the Colt six shot Detective Special. The 856 revolver shoots more like a five-shot J-frame than a six-shot Colt, but it also holds six cartridges. This is good to have! The 856 is a steel frame revolver, the 857 is an aluminum frame revolver. The 856 is compact enough and rides light, but the 857 rides even lighter. Either is a six-shot double-action revolver with exposed hammer chambered for the popular .38 Special cartridge. S&W 442 five-shot cylinder compared to the Taurus. 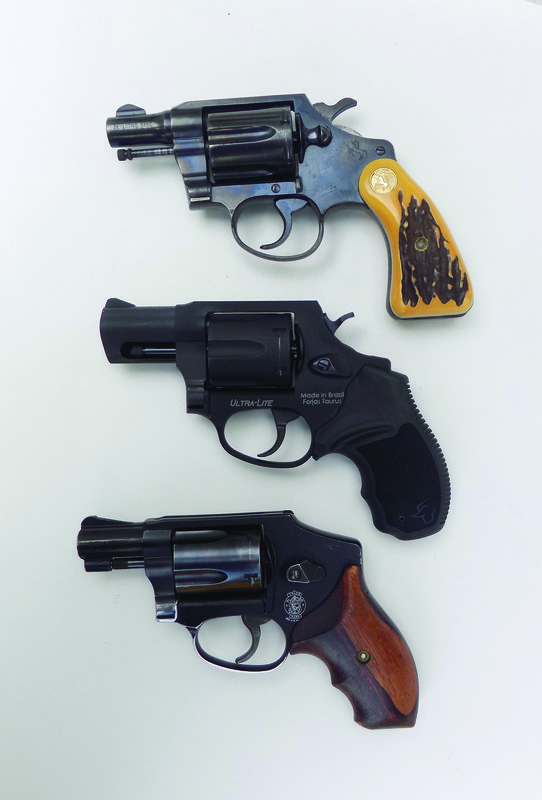 Top to bottom Colt Detective Special six-shot .38 Special, the Taurus 857 and Smith & Wesson 442 for comparison. The 442 is a five shooter. that the rubber grips are offset from the frame in a manner that prevents the metal frame from contacting the hand during recoil. Checkering on the sides and backstrap of the grips is well done. There is a slight shelf or finger rest on each side of the grip that guides the finger to the trigger on one side and may act as a thumb-rest on the other. The design of the grip seems to raise the bore axis and allows good leverage when firing. When the .38 Special five-shot was first introduced it was often referred to as a .38 on the .32 frame. This was correct. When introduced, the I-frame Smith & Wesson was chambered for the .32 Smith & Wesson Long cartridge and held six shots. The .32 is far from an effective personal defense caliber. Later the .38 Smith & Wesson (an underpowered short .38) versions introduced held five shots. The Taurus fits well in the Blackhawk! pocket holster. 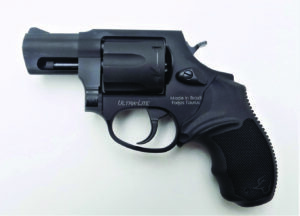 The J-frame with its lengthened chamber and wider frame window chambered the powerful .38 Special cartridge. Modern technology applied to a 1890s design now allows six shots in the J-frame envelope. The revolver handles and shoots like a J-frame and holds one more shot. 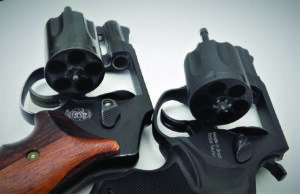 Let’s look at the Taurus 856 and 857.
case scenario, at contact range, the revolver may be pressed into the adversary’s body and fired with every press of the trigger. A self-loader would jam after the first shot. In this busy world few of us have the time needed to practice. This isn’t the handgun I would wish to have when confronting a gang or an active shooter but the snubnose .38 will save your life and is well suited to close range defense. Just the same―the type is surprisengly accurate given a skilled shooter. 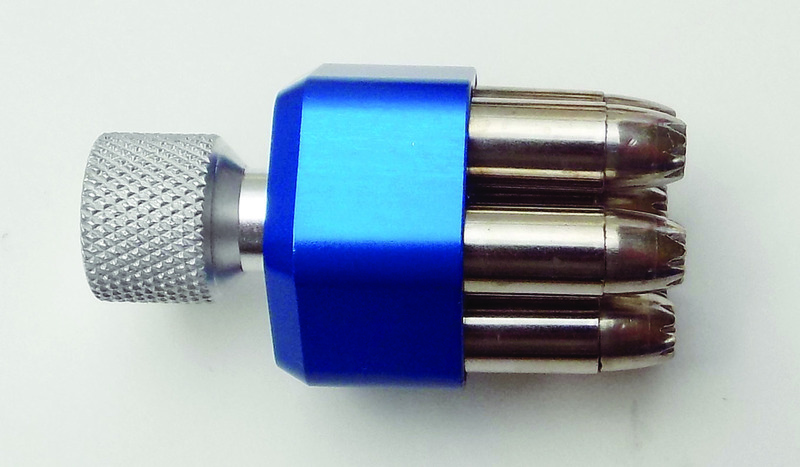 The flats of the Pachmayr speed loader make for a compact profile. I evaluated the Taurus 857 with a wide variety of ammunition over the past few months. These included 110- and 125-grain hollow points and a number of 148-grain target loads as well as 158-grain RNL bullets. The revolver has performed well and has never failed to cycle or fire. This isn’t the smoothest double-actionn trigger on the market but it is consistent and allows good hits to seven yards. It takes more concentration to make double action hits at ten yards. The wide, smooth trigger works well for good leverage. With the single-action mode of fire center hits on man-sized targets were possible at a long 25 yards, but this is a stunt with the snubnose .38. By staging the trigger, bringing it back just short of the hammer breaking, taking a good sight picture, and dropping the hammer, accuracy is much improved. The trick is to do this quickly. In other words, this piece is as accurate as any five-shot two-inch barrel revolver, more so than some, but holds six shots. I fired a good quantity of the Winchester 158-grain RNL loading and found it a good target load. 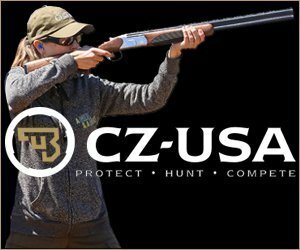 An overlooked loading I find well suited to personal defense is the Winchester Silvertip 125-grain +P loading. Recoil is modest and the balance of expansion and penetration favors expansion. 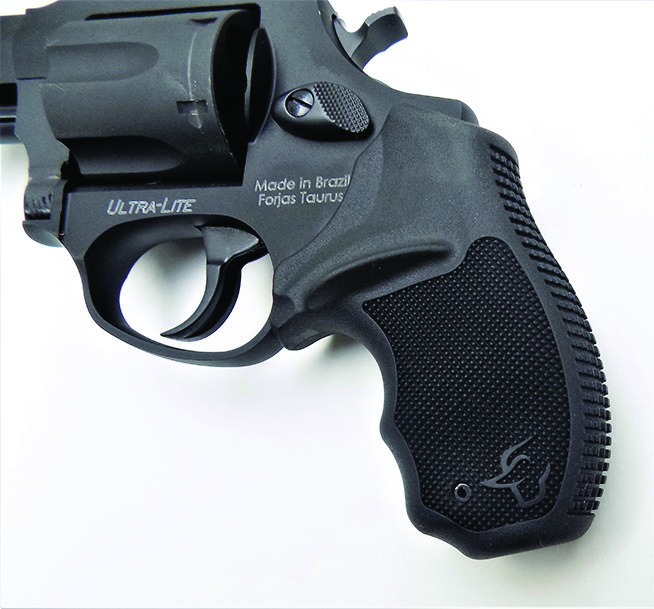 The grip panels of the Taurus are ideal for control when firing heavy loads. Lyman’s new Pachmayr Speedloader works well. Some loads are heavier than others. While controllable and comfortable due to the rubber stocks, muzzle flip is pronounced. This revolver demands practice to master. I used the Blackhawk! 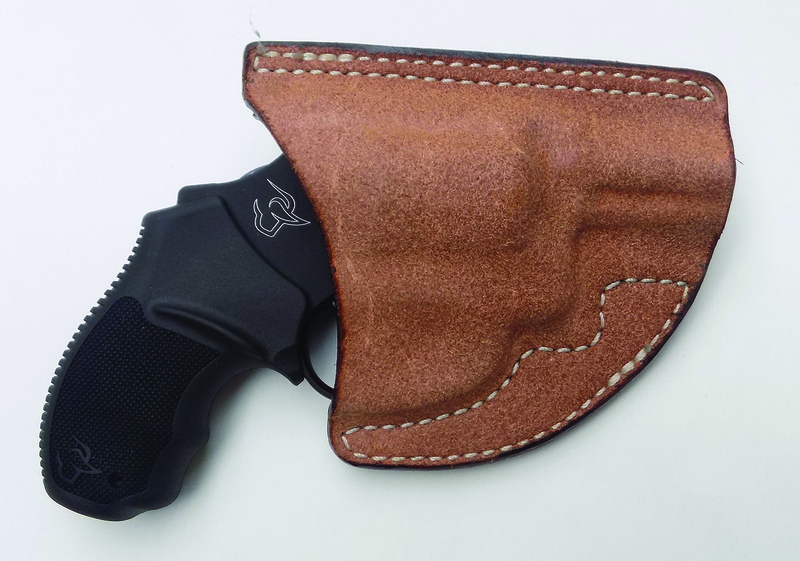 All-leather IWB and pocket holster with the Taurus 857. Frankly it was a stretch for these J frame holsters. but they would have been too loose to have been used with the five-shot Taurus 85 as an example. But they serve. Makers will offer holsters for the 856/857 soon and some holsters will accommodate the Taurus. The Taurus 857 is a lightweight .38 and might be a live saver in the right situation. In any case peace of mind comes cheap with this revolver. The list price is over three hundred dollars but the revolver is often found for sale at less than three hundred dollars.